The Easter bunny is almost here! 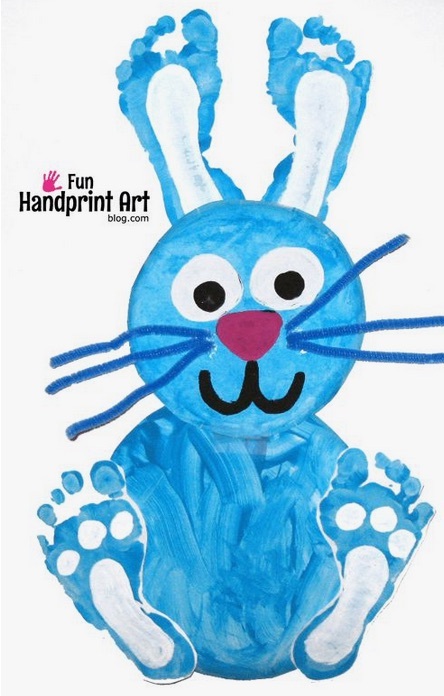 If the thought of dyeing eggs leaves you cringing over the mess, why not try out this adorable paper plate Easter bunny project instead, courtesy of Fun Handprint Art? P.S. If your kids are having any trouble hopping around on their sweet little feet, bring them in for a quick checkup with Dr. Schneider! 1. Have your child paint 2 paper plates each: 1 regular-sized & 1 dessert-sized. You could also just use paper & cut the circles out. 2. Cut the rims off of each paper plate if you’d like. 3. Make 4 footprints per child and cut them out when they dried. On 2 footprints (each), paint an odd-shaped oval. These will be the ears. On the remaining footprints, painted an oval & 3 circles to resemble a bunny’s foot. 4. Tape or glue 2 of the footprints to the dessert size plate as ears and 2 to the dinner size plate as feet. Glue the dessert plate head to the dinner plate body. 5. Make the facial features by painting or drawing on eyes, a nose, a mouth or bunny teeth, and glue on pipe cleaner whiskers.